Greet the sunrise from your outdoor cycling class or jog on a treadmill just above the ocean waves—who says fitness can’t be an exercise in luxury? 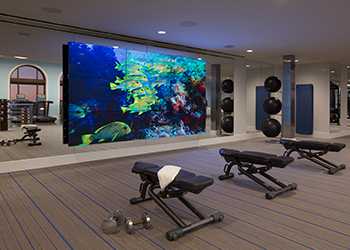 If this setting doesn’t inspire your workout, nothing will. Seated above the resort’s Mediterranean-style Beach Club, Ocean Fitness is masterfully designed with a fluid, indoor-outdoor layout. 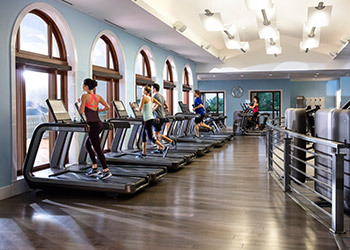 Our 6,000-square-foot oceanfront facility features 10-foot-tall arched windows that peer out to an expansive terrace for outdoor workouts—think cycling and yoga—and to the Atlantic just beyond. 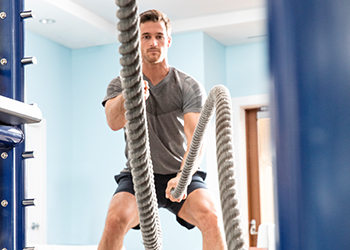 Our best-in-class Ocean Fitness center is also home to a network of advanced fitness solutions and equipment, an array of weekly classes, and the expertise of professional instructors, and personal trainers, eager to deliver to you a highly customized and energizing fitness experience. The standard dress for Ocean Fitness is fitnesswear, please. T-shirts, tank tops, sweatshirts, sweatpants or shorts are acceptable. Closed-toe athletic shoes must be worn at all times. Bathing suits and cut-off shorts are not permitted. To enter Ocean Fitness, please bring the key to your guest room or suite.